Morning lifting is a tradition that was started when Coach Cav (Sam Cavallaro) first became head coach of the HHS football program during my freshman year in 2016. This tradition happens every Monday, Wednesday and Friday morning at 6:30 am. Weight lifting originally had no effect on me, but I had no idea the effect it had on the people around me. My twin brother is one of those people affected by morning lift. Elijah Putnam is seen as a leader of the weight room and played varsity football his junior year. However, Elijah wasn’t always like this. Elijah used to be the scrawny kid on the football team. He was the smallest kid on the field his freshman year, and when he got home he was the smallest out of all of his brothers. Elijah was known as the toughest kid on the team, even though he was the smallest; he could take a hit. However, that didn’t please Elijah; he wanted to be bigger. Elijah was interrupted from starting lifting after football his freshman year when he broke his pinky finger. As soon as Elijah was cleared to do strenuous activities, he hit the weight room for the rest of winter until he took a break for lacrosse. Elijah then had trouble going to the local gym over the summer because he felt like he was just not motivated. When sophomore year started, Elijah again realized how small he was on the football field. He didn’t get on a varsity sport his sophomore year but discovered a new position he was good at: center. When the season ended, many of the starting players left, including the starting center. So the question on everyone’s mind was “who is going to step up and be the varsity center next year?” Elijah wanted the position, and as soon as he could he was in the weight room getting bigger for football. Elijah finally had something to work for, and he didn’t stop working until he reached his goal. Elijah played varsity center this past year, and although he was the smallest guy on the line, that did not make him small. Morning lifts help “Jumpstart” Elijah’s day and help him wake up in the morning. The only downside of morning lift is the fact that it cuts into his schoolwork. 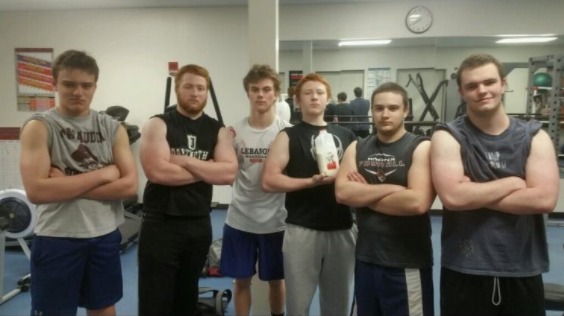 Morning lifting is a team building activity that helps strengthen the football team. The Lift always ends with a abdominal workout. The team then does a breakdown, which usually involves something like “Work” or “Get Better.” One thing morning lifters look forward to is Cereal Fridays. Friday is like any other lift except at the end of the lift you get to enjoy a nice bowl of sugary cereal. Elijah tries to go to every single morning lift and afternoon lift, but sometimes that isn’t enough for him. Elijah is hoping to get more lifting programs in the school, such as an activity period lift. He has already talked to Principal Campbell, who agreed that it was a great idea. They are working on getting teachers to cover the weight room. Elijah hopes that lifts during school will give more students an opportunity to get in the weight room for whatever sport they are playing. Recent photo of Regular Morning Lifters on March 23. From left to right: Ben Wagner, Robert Putnam, Jack Loftus, Elijah Putnam, Colby Marsh, and Eamon Worden. Chris Robertson is missing from the picture.